Power Company of Wyoming is developing renewable resources in an environmentally responsible manner on federal and private land. 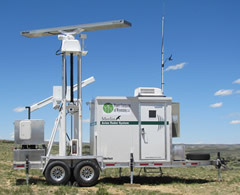 Since 2008, PCW has been collecting wildlife data on and around the ranch to support the BLM-led Environmental Impact Statement process, which is the highest level of environmental analysis applied under the National Environmental Policy Act, as well as to support supplemental NEPA analysis, an application for an eagle permit, and state and local permit processes. But in addition, PCW has proactively moved forward with programs to both better understand wildlife habitats and use and to implement conservation measures that will avoid, minimize and mitigate potential impacts to the ranch’s wildlife and ecosystems. The company retained industry-leading environmental consultants and biologists to help it develop and implement this comprehensive wildlife conservation strategy. Major efforts undertaken by PCW along with the Overland Trail Ranch include a comprehensive wildlife conservation plan, a Bird and Bat Conservation Strategy, and an Eagle Conservation Plan. These science-based plans will protect wildlife on the ranch and are intended to provide a conservation uplift for many of the species potentially impacted by wind energy development. The conservation plan is designed to conserve greater sage-grouse populations on the ranch as well as other sagebrush obligates. This is largely possible because ample land and water resources on the Overland Trail Ranch provide the flexibility to enhance 500 square miles of wildlife habitat. The best sage-grouse habitat will not be affected by wind energy development. PCW will not develop wind energy in designated sage-grouse core areas. At the same time, the conservation plan will continue to accommodate ongoing ranching and farming operations. Yet conserving sage-grouse and enhancing the sagebrush ecosystem is a primary objective for how this land will be managed today and in the future. This approach was developed after performing a detailed assessment of threats to sage-grouse and identifying conservation measures to eliminate or minimize these threats. PCW’s environmental consultants also have completed extensive vegetation and habitat mapping field work, as well as gathered a wealth of other biological data. Demonstrate the relative use of the wind development areas to enable a better understanding of how sage-grouse in the assessment area and populations as a whole respond following wind project development. Site all wind turbines and related infrastructure in a way that avoids and minimizes potential impacts to sage-grouse to the greatest extent practicable. Coupled with PCW’s conservation measures, this science-based monitoring program will ensure PCW is achieving its goal of a net conservation benefit to sage-grouse. PCW is working to develop wind resources in a manner consistent with the conservation of avian and bat species as well. A comprehensive, science-based avian and bat monitoring approach – which combined avian radar technology and traditional monitoring methods – was used to better identify usage and patterns. Results from the monitoring program allow PCW to identify the most appropriate conservation practices to avoid, minimize and mitigate potential risks to avian and bat species. Further, PCW has voluntarily identified about 105,000 acres of “Turbine No-Build Areas” across the ranch, restricting turbine development from the areas that the data showed were used most frequently by raptors. Overall, PCW’s plan and wind project have been carefully crafted to comport with the U.S. Fish and Wildlife Service’s 2013 Eagle Conservation Plan Guidance and the Service’s 2012 Land-Based Wind Energy Guidelines. Here are the six major elements of PCW’s monitoring protocols and the conservation plan development approach. 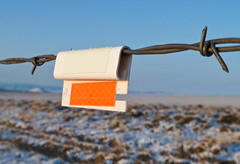 From March 2011 - July 2013, an avian radar system was used across the Overland Trail Ranch to monitor avian and bat activity and habitat use patterns. The avian radar system collected detailed avian and bat use data 24 hours per day and could map activity across 80 square miles. Radar data identified high use areas and enabled PCW to site the wind project in a manner that reduces impacts to avian and bat species. Five to six locations were surveyed with the radar each year to provide precise, site-specific data in the wind development areas. Long-watch raptor use surveys were conducted at locations across the ranch. Avian use data was used to validate radar survey results and to document avian use in areas that were not surveyed directly by the radar system. Each site was surveyed 4 to 8 hours per survey day. Avian point count surveys were conducted at 60 locations across the ranch to document migratory and resident use. Breeding and resident bird grid surveys were conducted at 16 locations throughout the wind development areas to map the relative abundance and density of bird activities during non-migratory periods. Raptor nest surveys were completed for all areas within 5 miles of wind development areas (an area of nearly 1,000 square miles or 640,000 acres). 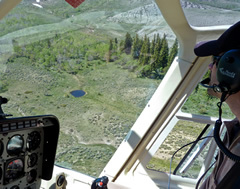 Helicopter surveys were used to survey suitable eagle nesting habitat and to survey known nests for other large raptor species. Follow-up ground monitoring was used to document nest success, identify nest condition, and to locate additional raptor nests that could not be identified during helicopter surveys. This work is ongoing. Prey base evaluations were conducted to evaluate areas containing prey densities sufficient for eagle and large raptor foraging activities. Data collected as part of the above surveys was used to develop an Eagle Conservation Plan (ECP) and a Bird and Bat Conservation Strategy (BBCS). These plans identify measures that will be taken to avoid, minimize and mitigate impacts to avian and bat species. In addition to raptors, bats and sage-grouse, PCW’s comprehensive conservation plan will promote conservation of many other wildlife and fish species in the project area. PCW is working with the U.S. Fish and Wildlife Service, Bureau of Land Management, and Wyoming Game and Fish Department to identify and implement appropriate conservation measures. Since many species are dependent on the same or similar habitats, conservation actions directed towards one species will benefit others as well. Power Company of Wyoming LLC is developing the Chokecherry and Sierra Madre Wind Energy Project, a 1,000-turbine wind farm to be located south of Rawlins in Carbon County, Wyoming. The project will have a long-term surface disturbance of less than 2,000 acres of the 320,000-acre Overland Trail Cattle Company ranch, due to each turbine’s small footprint. Because the wind power project spans an approximately 50/50 combination of interspersed private land and federal land managed by BLM, the project was analyzed in an Environmental Impact Statement, starting in 2008. The Final EIS was published in July 2012, and a Record of Decision approving wind development at this site was signed in October 2012 by Secretary of the Interior Ken Salazar. Right-of-way grants are anticipated after BLM completes its review of site-specific plans of development for the project components in Environmental Assessments tiered to the project-wide EIS. More than 17 miles of fence have been marked, and more than 10 miles of fence have been removed to reduce or eliminate risks for sage- grouse collisions and mortality. Bird diverters are installed on all guyed met towers to reduce risks for collisions and mortality. Habitat is being improved through enhanced rangeland management and active vegetation treatment including maintaining and enhancing native understory plants and revegetating fallow agricultural fields. A 170-acre area burned by a lightning-caused wildfire has been revegetated with a seed mix specifically designed to enhance sage-grouse brood-rearing habitat. Unnecessary roads are being identified for closure and reclamation to reduce fragmentation and remove conduits for predators. Water tank bird ladders were built by the Saratoga High School FFA Chapter and have been installed in many of the water tanks throughout the ranch to reduce drowning risks for birds and other wildlife species.